There were other issues of course, the orange offense dropped a number of good balls as did some of the members on the white offense, but the defense took advantage of the conditions and set the tone early and often with their play. The Texas offense had a gameplan/script on offense designed to feature Malcolm Epps and Jalen Green wasn’t having it. He put on a clinic on how to use physicality to disrupt the timing and advantages of a bigger receiver, always arriving with the ball on every toss Epps’ way and even early on a slant where he bumped Epps off his spot. Green was also ever-present and active on the edge in run defense. Whether he can hold up down the sideline against top Big 12 WRs wasn’t something that this scrimmage could prove one way or the other but that physicality should translate. If Green ends up being a guy that regularly gets help over the top and is asked to be an enforcer on the perimeter that would seem to be a role that he can execute very well. That’s no small matter either, Texas got a lot out of Holton Hill and then Davante Davis for their ability to shut down bubble screens or support the edge. 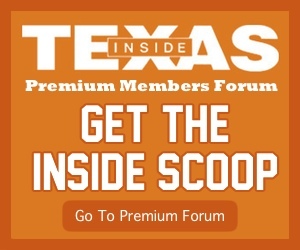 Given the reports on where Anthony Cook was before his injury, it would seem that Texas’ blue chip young cornerbacks are coming along nicely. Shark McCulloch was moving well out there as well, his INT was largely just a horrible decision by Ehlinger who seemed to forget he was there, but he was running laterally with some nice giddyup all night. I didn’t watch the defense as closely on this watch but Luke Brockermeyer and Russell Hine also showed well and made some nice plays. We may never see them play on Saturdays at LB but they sure are big and solid guys to have as your practice squad guys. Texas took advantage of their hybrid RBs regularly in this game and moved them all over the place to either do work in the passing game, catch the ball on screens, create matchups for the wide receivers, and clear up the middle of the field for QB runs or in routes. For instance, they motioned the RB out wide once to set up a slot fade route for Malcolm Epps. Thompson checked to it but the defense doubled Epps and left Danny Young alone in the flat, so Thompson checked down and hit him but the ball was dropped. The big gain to Devin Duvernay came when they motioned the RB outside him and a LB chased him to maintain man coverage matchups. Then Duvernay ran an under route and got a rub on D’Shawn Jamison, Sam Ehlinger hit him in stride, and then Jamison bounced off Duve as he took off for a big gain. The white offense mixed in a lot of the QB GT counter game that Oklahoma has utilized so effectively in recent years and that loosed Whittington on one bubble screen and Thompson on a few QB runs. Herman noted after the game that they’ve installed a number of new RPOs that they didn’t mix in for this game that they didn’t want to put on tape. They actually ran a fair number of concepts in this game, all stuff from the previous season, but it was still surprising how non-vanilla the game was at times and how often they were willing to run the ball and try to play smash mouth football. Whittington played pretty well in this game, turning 12 carries into 62 yards at 5.2 ypc and then catching four balls for 27 yards. I’d have to check the film but I was suspicious that for the second half Herman had Orlando back his defenders off a little bit and pretend as though the wind wasn’t blowing in the offense’s face. He was hitting the traditional cutback on inside zone reasonably well but he had a particularly nice run on a GT counter-read play, a scheme that often lends itself to setting up the RB to bounce outside which Whittington does as well or better than anyone else on campus this year or for the last 10 or so. Texas had a number of slip and bubble screens drawn up for him, many of which were thwarted by a defense that had them all sniffed out, including one where Jalen Green arrived with the ball and lit him up. The execution on those will be cleaner in the fall and harder for defenses to key when packaged with a more multiple play script. Don’t write off Malcolm Epps. 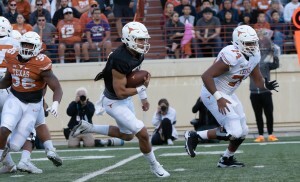 He was struggling with his route adjustments and Ehlinger was looking for him on a number of occasions and not finding him where he wanted to throw the ball against the coverage. I laughed the first time they ran a tunnel screen for the 6-6/245 pound monster, it was stuffed by B.J. Foster. The second time Epps had better blocking and found a lane, then showed some nasty quickness and shake in the open field. That time I just shook my head in amazement, this guy moves really well for such a big man. His non-catch on a comeback later in the game from Casey Thompson barely beat Jalen Green and ended up being ruled out of bounds but it was impressive. 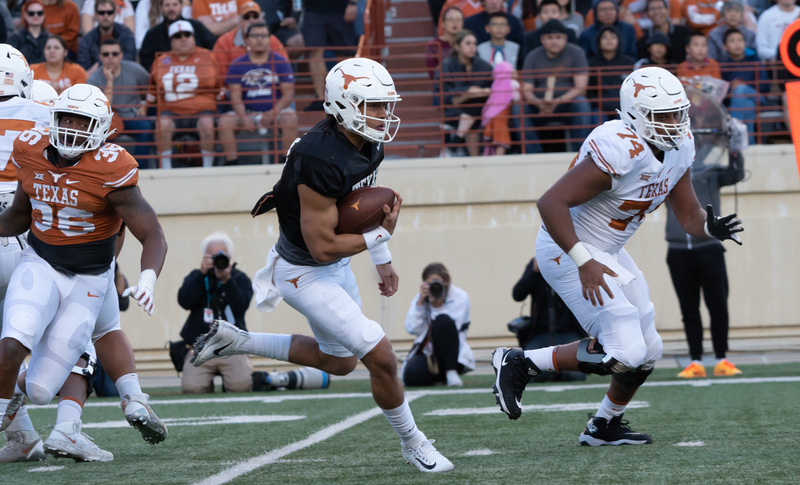 He was starting to put it together later in the contest and the attention he got from Ehlinger and Collin Johnson on the sideline after the drives made clear that they see him as worthy of investing in. When Epps won a circle drill against Foster I figured he was ready to go in this game but it took him a fair while to get going. Still, those hands and that athleticism makes him a pretty fascinating talent to watch moving forward. This was the QB stretch play that produced so many short-yardage pick-ups a year ago. They were on track to pick it up here with the play and then Overshown scraped over from the opposite hash to lay Thompson out. The offense then lined up in the 4×0 unbalanced set to run the other “touchdown play” a tight zone run to the RB, but a bad snap thwarted the play and Thompson managed to dance free and across the line for the game’s only touchdown. Overall it’s clear that Thompson is figuring out where the ball goes in the passing game and at times gets some pretty good balls out and on target. He doesn’t always handle the pocket well and is much more likely to scramble when his first read isn’t there, he doesn’t like the picture he’s getting, or there’s pressure. Currently if they needed Thompson to win them a game they’d need a gameplan that included heavy doses of RPOs and QB runs but he seems plenty capable of executing those at a high enough level to produce. Roschon Johnson obviously isn’t there yet. He didn’t get many snaps and what chances he did get were mostly runs or passes where he was clearly trying to adhere to a process rather than just taking off and things were just moving too fast. He’ll make a sizable leap before the season starts and isn’t on as fast a track as Sam Ehlinger was but hopefully he won’t need to be. Jordan Pouncey looked pretty good and seemed to be the guy Thompson trusted most, especially working to him on some option routes in the seams. Most of the key conversions from Thompson weren’t to Bru McCoy, who looked promising but not always in the right spot, but to the older guys Pouncey and Al’vonte Woodard. We probably shouldn’t read too much into that just yet, especially with a summer and fall for McCoy ahead, but it should have been encouraging for fans to see how those younger guys are picking up the system. Joseph Ossai had a sack due to inside pressure from Keondre Coburn that flushed Ehlinger to him and also ran down Thompson for a minimal gain on one of his many scrambles. Again, didn’t get a great look at the defense on this watch but he seemed to be mostly working off the edge. He also carried a vertical by Jordan Whittington pretty well but then got beat by an amazing back shoulder throw by Ehlinger only for Whittington to drop it. He definitely flashed, he moves really easily out in space. Cameron Dicker is a real weapon, hopefully they don’t need him to pull out a lot of wins but it sure is nice to know that he could. I didn’t pay much attention to the punting, that’s more of a @Scipio Tex move to take note of how a kicker looks and making a note, but potentially Texas could have a very strong kicking game this season. An easy way to produce better margins of victory and some blowouts is to be excellent on special teams. The RBs are going to be heavily involved in the passing game. They had Keaontay Ingram and Jordan Whittington working the normal RB passing work that they utilized a year ago and you know there’s going to be so much more once it’s time to start winning games. We probably won’t know what all they have in the works until they host LSU on September 7th.